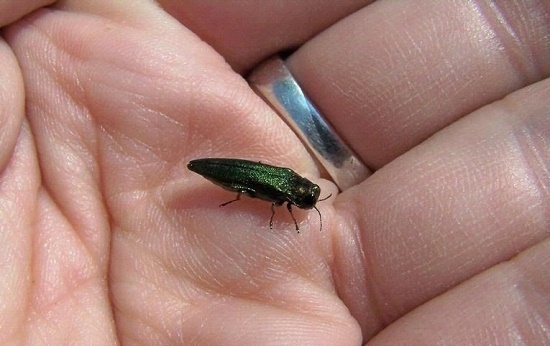 The emerald ash borer (Agrilus planipennis) is perhaps one of the most destructive tree pests we have seen in decades. 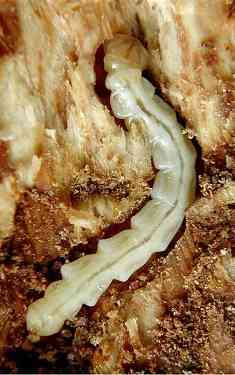 Larvae of this insect feed under the bark of ash trees. They damage the ability of the tree to transport water and nutrients, and may kill the tree in as little as two to four years. This shimmering beetle was first discovered in southeastern Michigan in the summer of 2002, and has since spread into Ontario Canada and has been found in 35 states and the District of Columbia: Alabama, Arkansas, Colorado, Connecticut, Delaware, Georgia, Illinois, Indiana, Iowa, Kansas, Kentucky, Louisiana, Maine, Maryland, Massachusetts, Michigan, Minnesota, Missouri, Nebraska, New Hampshire, New Jersey, New York, North Carolina, South Carolina, South Dakota, Ohio, Oklahoma, Pennsylvania, Rhode Island, Tennessee, Texas, Vermont, Virginia, West Virginia, and Wisconsin. Oddly enough emerald ash borer is not considered a destructive pest in the native area of Asia where it is originally from. Natural predators, insect disease, and ash tree resistance is enough to keep this insect in check. These natural controls were left behind when emerald ash borer was accidentally introduced to North America through international trade. Over 40 million ash trees have been killed in Michigan. Millions more in other infested states. The majority of Iowa towns and cities have planted ash trees along streets and in parks. Many private homes have ash trees for shade and comfort. Removal and replanting of dead and dying ash trees will cost Iowa communities millions of dollars. Ash tree symptoms can easily be confused for disease, enviromental damage, or other insect problems. 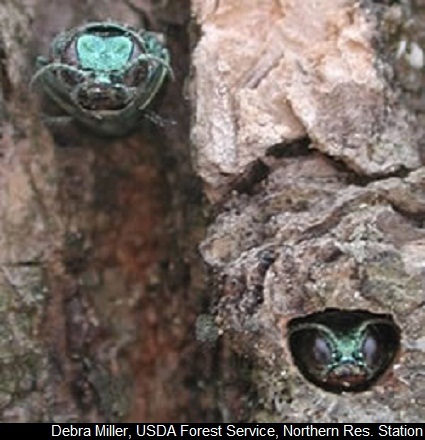 The emerald ash borer is difficult to find because the beetle does not respond strongly to pheromone-based lures; therefore, there are only marginally effective detection traps available. While many trees infested by insects have been stressed or diseased, emerald ash borer may also infest healthy trees that show no problems. The larva or 'grub' is the destructive life stage. 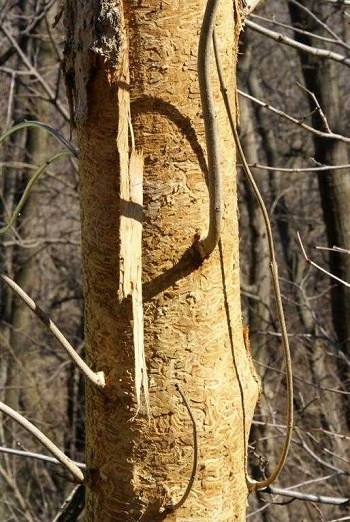 Adult beetles cause very little damage to trees. They do feed on ash leaves, but not to excessive levels. The biggest threats concerning Iowa's ash resources are the transportation of ash firewood, ash logs, and unprocessed items of ash from infested areas. Although the beetle is capable of strong flight, human activities are the primary cause of long distance spread. There are now Federal and State Laws, prohibiting the transportation of the above mentioned articles from EAB infested areas. Firewood that is sold in Iowa must be labeled to include the source company or person, location of harvest, and tree species. 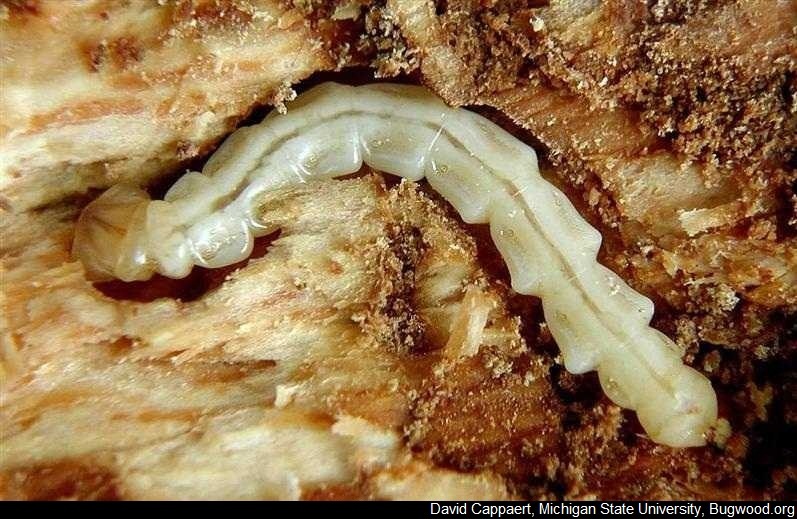 Research on the emerald ash borer had been very limited prior to 2002 when it was first found in Michigan near the port city of Detroit. There existed less than two pages of scientific literature in the entire world on this insect, and those pages were published in China where emerald ash borer is a native species. Basically all scientific information regarding this insect had to be newly learned, as it simply did not exist. Entomologists at the USDA and several Universities are intensely studying this small, yet highly destructive insect, in order to thoroughly understand it. Research has included basic biology such as habitat, lifespan, flight capabilities, mating, and hosts preferences. Additional research such as natural insect predators, preventative insecticide products, resistant varieties of ash, and trapping techniques are ongoing. 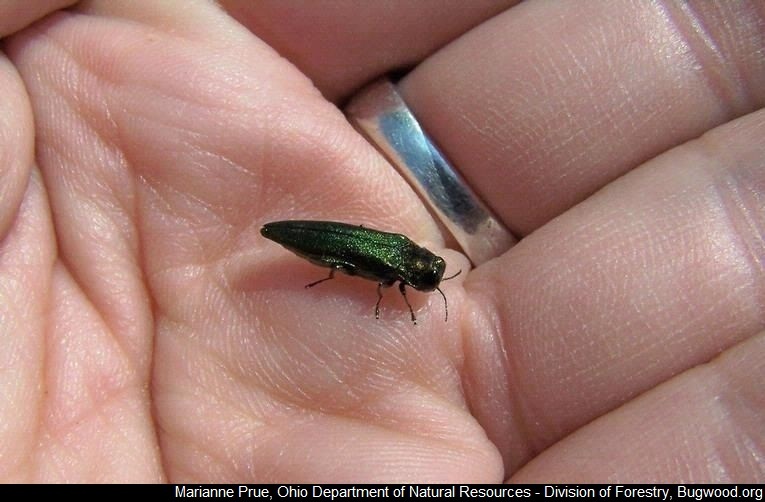 Emerald ash borer has been found to infest only ash trees in the Midwest. This includes all green ash, white ash, and black ash varieties common to North America. Trees measuring as little 1-inch in diameter and larger can become infested. This may occur in woodlands, as well as landscaped urban areas. EAB can also feed on white fringetree, Chionanthus virginicus; although not common in Iowa, it is being installed in landscapes of warmer climates in the United States. 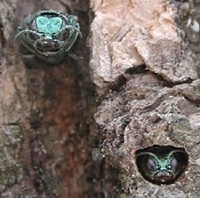 It is believed that emerald ash borer arrived in the United States stowed away in wooden crates, pallets, and shipping material containing cargo from the native area of Asia. DNA testing has revealed that 3 distinct populations of EAB occur in the USA, possibly meaning that more than one accidental introduction of EAB to the United States has occurred.